If you care about environmental, health, social justice and animal welfare issues, it can be exasperating to navigate the complexities of what to eat. (Assuming that you have that privilege, of course.) Is almond milk actually a better alternative than cows’ milk? Almonds require lots of water to produce, after all, but cows use a lot, too. Plus, there are all those debates about the health effects of dairy. What about a processed bean burger versus a burger made from local grass-fed beef? The beans are shipped from far away, which means carbon emissions, but then again cows release a lot of methane. What about that tofu stir-fry compared to that shrimp stir-fry? Tofu comes from soy, which is wrapped up in narratives about deforestation and hormonal imbalances, but shrimp is frequently implicated in human slavery. Many people, including those of us at the CLF, emphasize the importance of shifting toward more plant-based diets and eating lower on the food chain. The reasons for this shift are many: to mitigate the worst climate change scenarios, to minimize the need for industrial food animal production (which contributes to the growing antibiotic resistance crisis; harms the health and wellbeing of workers, rural communities, and animals; and pollutes our water and air), to improve consumer’s health, and to moderate our stress on global fisheries. Others, however, dispute the merits of plant-based eating, mostly in provocative but misleading ways (good for attractive headlines, not so good for public education!). For example, last year we experienced the bacon vs. lettuce debate when a press release of one study discussed the environmental impacts of these two foods on a per-calorie basis, exaggerating the impacts of the latter given that typical servings of these foods contain vastly different caloric amounts. Other articles have dismissed plant-based diets entirely on the basis that certain plant foods (e.g., avocados, palm oil, almonds, rice) have other unsustainable or unjust attributes, disregarding the reality that such diets do not necessarily (or need to) concentrate on these foods. Even environmental advocates often over-emphasize the carbon-sequestering potential of pasture-raised meats without addressing the concomitant need to significantly reduce our demand for animal-based foods if we want to raise all of our animals this way. Some of these arguments against shifting towards more vegetarian eating patterns are based in truth. For one, reducing meat consumption does not automatically reduce the environmental footprints of one’s diet. Dairy products, for instance, have a higher greenhouse gas (GHG) footprint per serving than poultry, pork, or many types of fish. This exemplifies the fact that the types of foods replacing meats can significantly affect, either negatively or positively, the impact of altered dietary patterns. Other arguments, such as the message to concentrate on reducing food miles rather than animal product consumption, are not as valid. Eating “locally” may confer a number of other desired benefits—such as increasing social connections between producers and consumers—but transportation accounts for a relatively small proportion of foods’ GHG footprints. In most cases, the types of foods people eat and how those foods are produced are more important than how far they travel or how they are processed. Fortunately, a new report released this week by Health Care Without Harm offers a comprehensive look at which foods best promote health, food security, social justice, ecological sustainability, and animal welfare (full disclosure: I co-authored it), particularly when replacing and reducing meat on the plate. 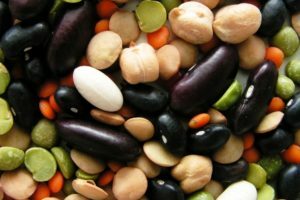 It does so by summarizing and analyzing the available academic literature on the impacts of whole food protein options, with an emphasis on legumes (such as pulses and soy), nuts and seeds, eggs, seafood, and dairy. The report is specifically aimed to assist healthcare institutions and others in the foodservice sector in transitioning their menus and purchases to alternative protein options that may optimize health, environmental, social justice, and animal welfare outcomes. Targeting what and how our institutional food services procure is critical given the reality that hospitals, schools, workplace cafeterias, restaurants, and other caterers play an essential role in shaping the types and amounts of food that we consume through determining which ingredients are offered on menus, how much they cost, and the desirability of their preparation. However, food activists, journalists, bloggers, and consumers may also appreciate this comprehensive guide to navigating the complexities of eating healthfully and ethically. Take a look to answer your most pressing food dilemmas, study up before for your next shopping trip, or accumulate some factoids for your next cocktail conversation. As a vegetarian, scientist, and partner of someone who raises food animals, I really appreciate that you acknowledge how complex this topic is. Looking forward to reading the report.